While the topic of death may be taboo, it’s something all adults should be considering. Many people in their 20s and 30s don’t worry about insurance as they don’t see their potential death as a reality. This is true if you look at death as coming as the result of natural causes. But we hear daily of young people dying before their time from diseases, accidents or violence. Without having made the necessary provisions, such deaths place a huge financial burden on the deceased’s surviving family. Should I have Life cover or Funeral cover? In a word: both. These two types of cover are completely different and equally necessary. You need to make provision for benefits in the immediate aftermath of your death and benefits to sustain loved ones in the long-term. For the majority of South Africans, a funeral is very expensive. It starts with the catering necessary for friends, relatives, and neighbors who come to the house to sympathize prior to the funeral service. This is followed by the funeral itself and the burial. The food and tent needed for the customary meal served afterward is another expense as is the tombstone and subsequent unveiling. Providing the deceased with dignity in death and a funeral that demonstrates the requisite respect for them is a pricy business. This is the reason funeral cover is needed. Without Funeral cover, all these expenses would have to be funded by the family and friends of the deceased. This places an enormous financial strain on them in addition to the emotional struggles they encounter after the death. The funeral cover provides the relatives of the deceased with short-term financial relief. Funds are released upon the claim being made. Most Funeral cover organizations provide the family with airtime to make the arrangements. The lump sum paid out is used to cover all the funeral costs. Money left over after the funeral can be used for day-to-day expenses. More than one person can be covered on a Funeral cover policy. Many families elect to take out one policy that covers all family members. As with any type of insurance policy, there are exceptions and exclusions. These appear in the fine print of the policy. The policyholder should be aware of them prior to signing the contract with the insurance provider. 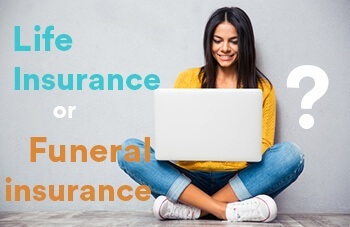 Life cover is a much larger lump sum of money paid out in the event of the insured person’s death. This payment is made a few months after the death. The money paid out from life cover should be used to pay off the deceased’s debts. Thereafter, the remaining money should provide financial security for the insured person’s dependents or family. Investing the remaining money and living off the interest of the lump sum is one way to do this. Alternatively, invest the money in endowment policies and education policies to secure the futures of young dependents. Spending the proceeds of a life cover pay-out all at once can place the deceased’s family in jeopardy further down the road. Beneficiaries should use the services of a financial adviser to help them make informed decisions about what to do with the money they have received. These days, few ad breaks don’t feature an insurance commercial. They encourage people to take out life and funeral cover over the phone. We see testimonials of those pleased with the company. However, we don’t hear the stories of those who didn’t receive a pay-out because of a loophole the insurance provider has found to avoid payment. Funeral cover and life cover serve different purposes. That’s why it’s necessary to have both. Use a financial adviser to make sure you get a product that will best serve your individual needs. Keep up to date with premium payments to avoid losing the benefits.